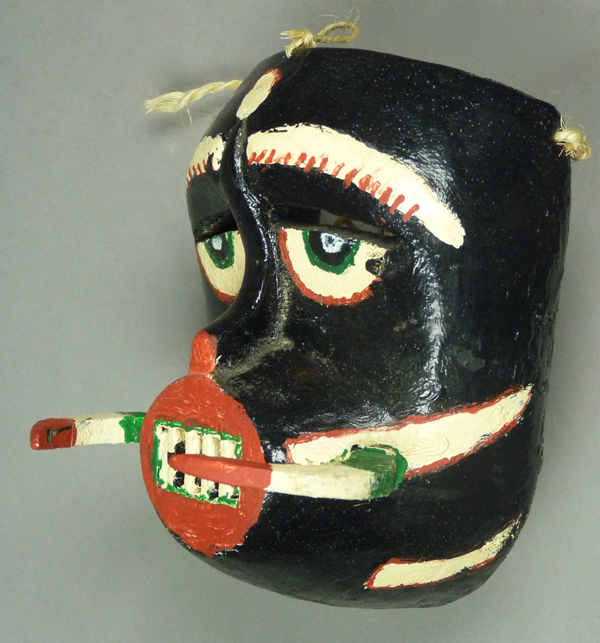 Last week we looked at photos of Tusked Negrito masks from a collection that was probably created in the 1950s and 60s, and then I presented three Tusked Negrito masks that looked like those in a group photo. Today we will examine two additional pairs. I bought the first pair from Robin and Barbara Cleaver in 1995. 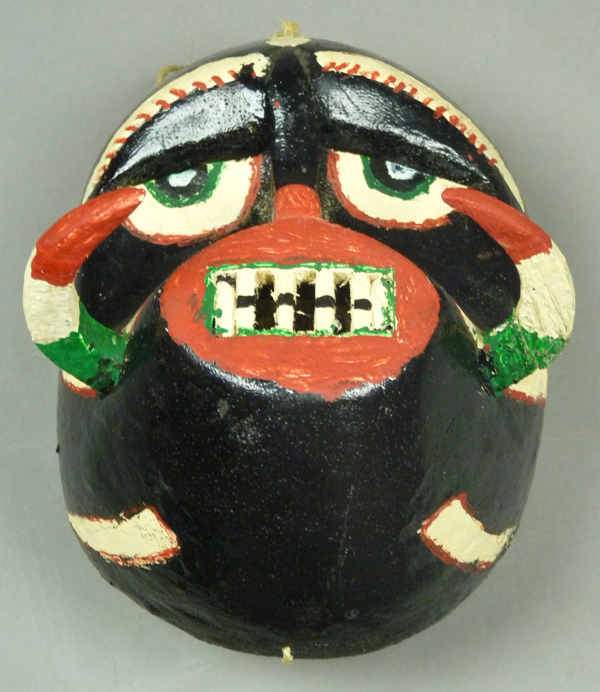 They had obtained them from an older Oaxacan collection. There was an identical pair that the Cleavers kept for their own collection, but later sold to the Museum of International Folk Art in Santa Fe, New Mexico; you can see those two in Barbara Mauldin’s book, Masks of Mexico: Tigers, Devils, and the Dance of Life (page 67), where she estimated them as having been made in the mid-1950s. Here are my two masks from that set of four. They are very similar to one another, and each has leather tusks, as do the other two in the museum collection. Here is the smaller of the two. Two upper teeth are indicated by paint on the upper lip. In general there appear to be layers of old paint and the current features probably reflect sloppy repainting. Like the masks in last week’s post, these have snouted mouths. 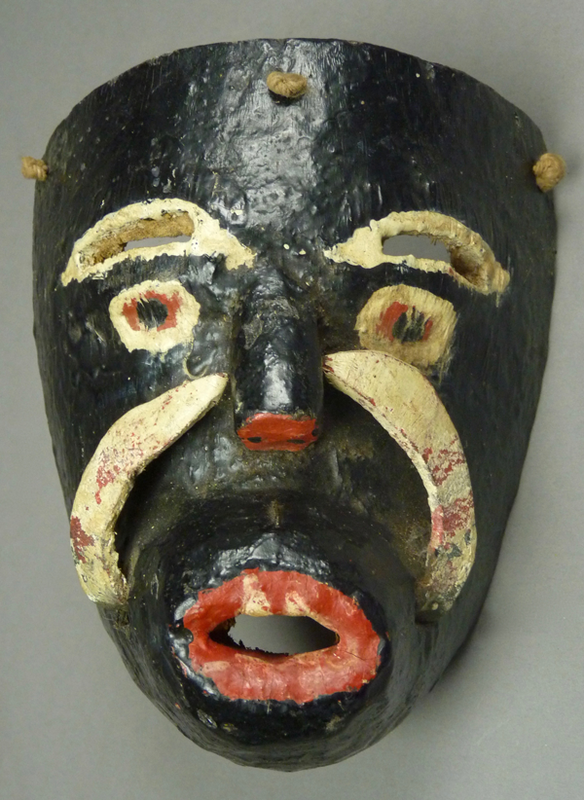 This mask is 6 inches tall, 5¼ inches wide, and 3 inches deep. It retains an original neck strap that is attached to the chin. The back is stained from use. There is evidence of a mild infestation of boring insects along the right side, but no sign of significant damage. The ends of the leather tusks pierce the mask on both sides of the open mouth, and in this rear view it is particularly clear that the tusks are made of leather. Here is a Youtube™ video of dancers wearing such masks. 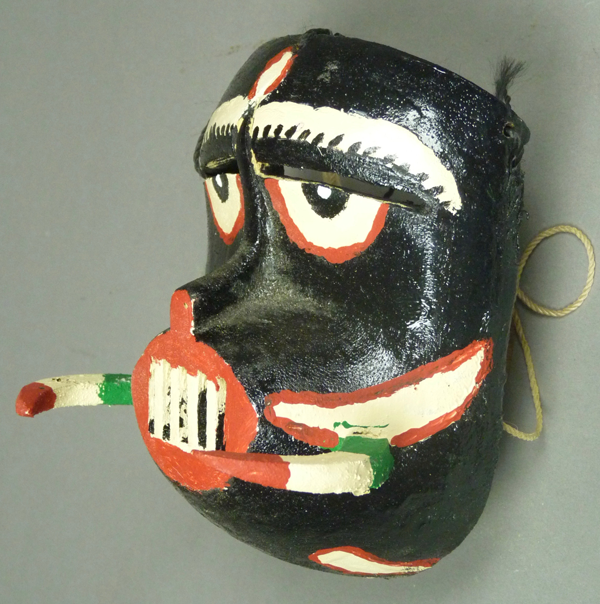 The second mask is slightly taller, there are four painted teeth on the lips, and the leather tusks seem a little larger. Otherwise these two masks are very similar. 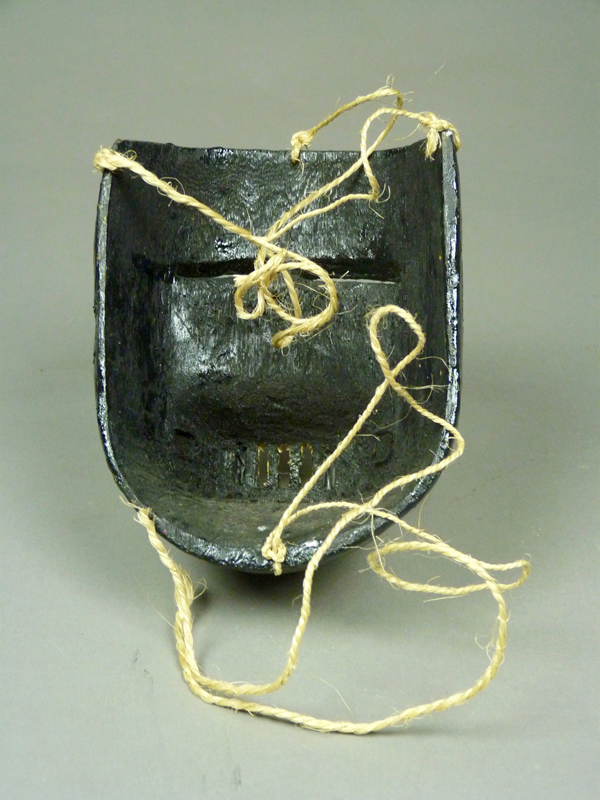 This mask too has holes in the chin for the attachment of a neck strap. It is 6¼ inches tall, 5 inches wide, and 3 inches deep. The back has similar staining as the first, and the holes in the back of the chin for a neck strap are also visible in this view. 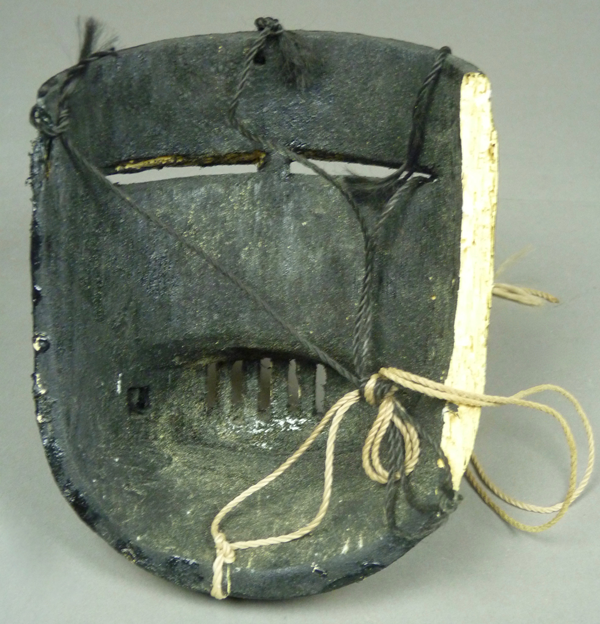 The ends of the leather tusks are also prominent on the back of this mask. 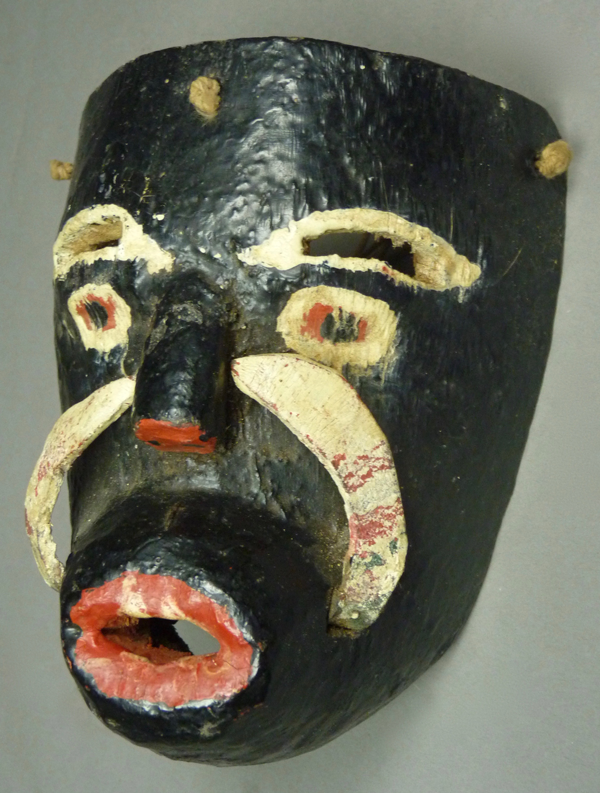 Now we will consider another pair of Tusked Negrito masks. I bought these from Mary Jane Gagnier de Mendoza of the Mano Magica Gallery in the city of Oaxaca (in the Mexican state of the same name) in 2003. They had come from a set of eight. 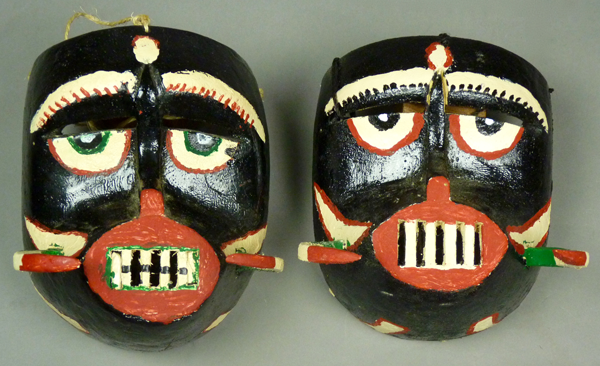 These masks are painted black on their backs and it is difficult to tell if they were ever danced. However, each does have a full set of straps, including neck straps, so they may have been used in at least one performance. In Mary Jane’s book—Rituales de Armonia: Fiestas de Teotitlán del Valle—she describes La Danza de la Pluma (92-97)and includes photos of Bufón dancers wearing Tusked Negrito masks in that performance (pp. 16, 95, 96). The masks in these photos have long protruding snouts or mouths, and prominent wooden tusks. 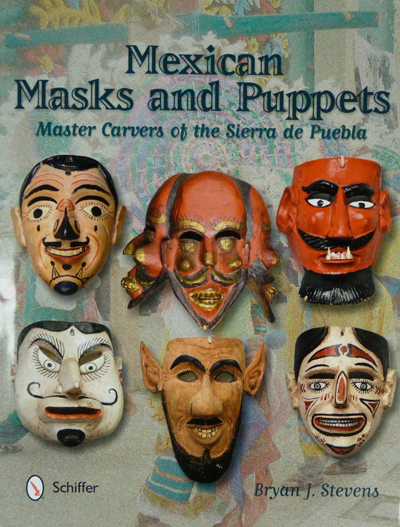 Here are Internet links to masked dancers of similar appearance to those in her book. 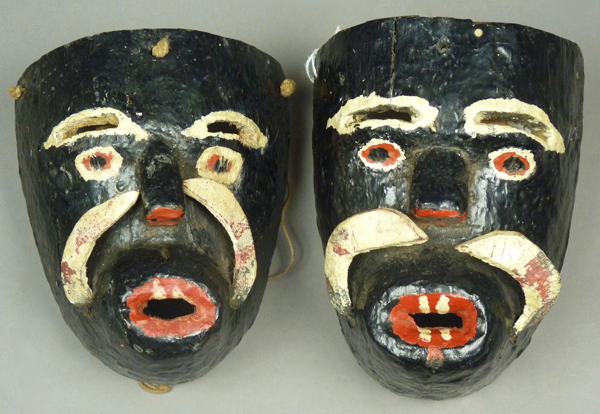 Here is this second pair of Tusked Negrito masks. This one on the left is completely intact. 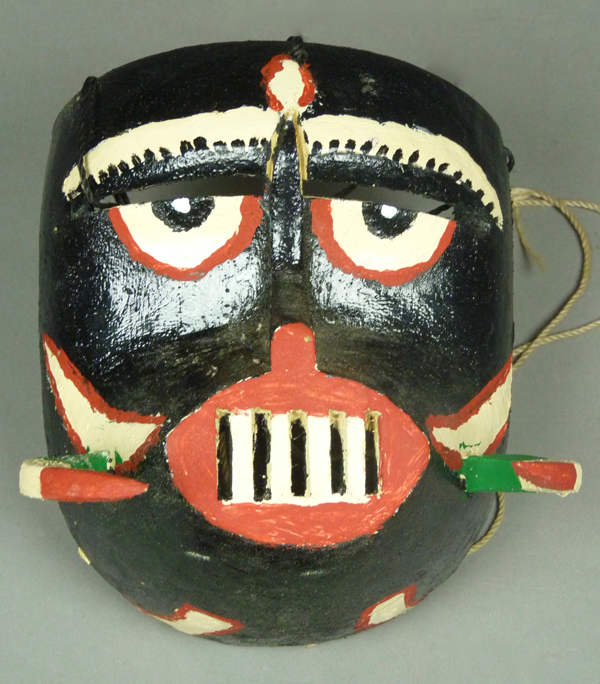 The nose and mouth designs are gracefully integrated on this mask and the next. 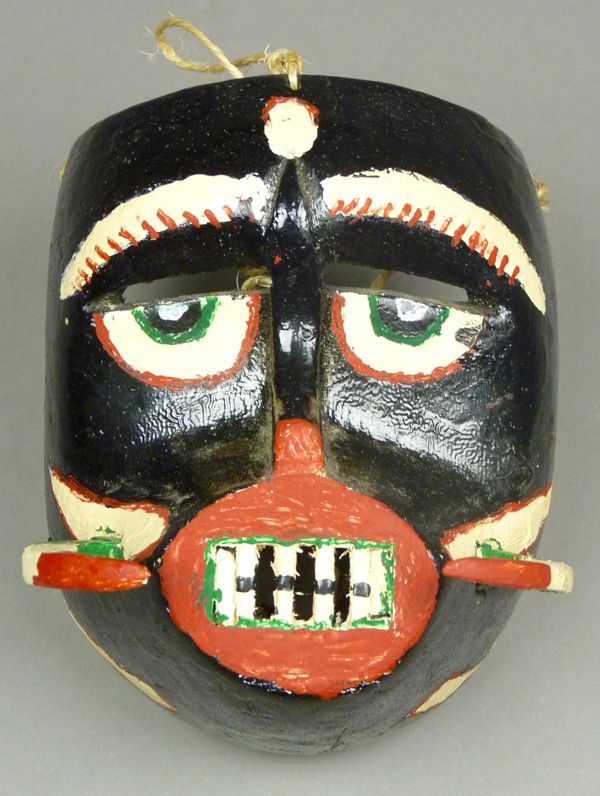 Note that the two mouths originally had the same barred design, but someone went to the trouble to fill in two of the slots, although this was not done on the second mask. To me, this implies that these masks were used by two different dancers, and that they were actually danced. 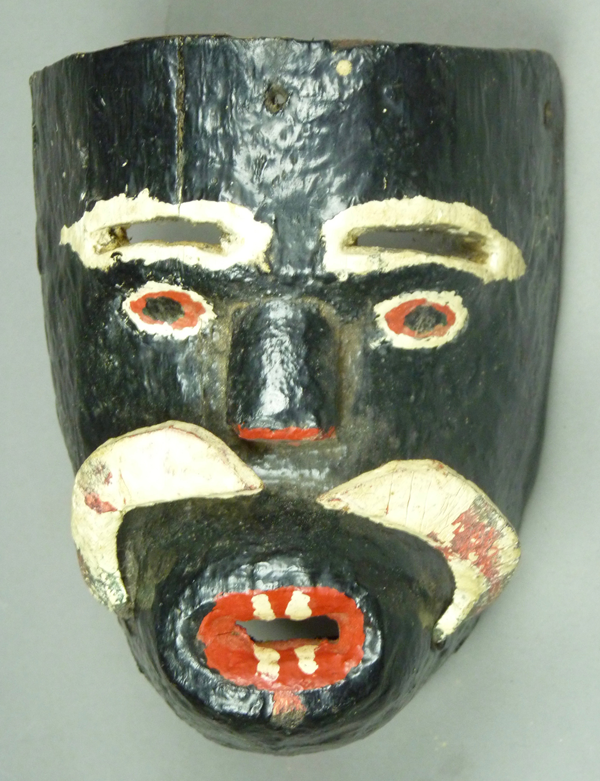 These masks literally have a double set of tusks, with one set painted and the second set carved (and a third set lower down). There is the chin strap, attached at the bottom of the rim. 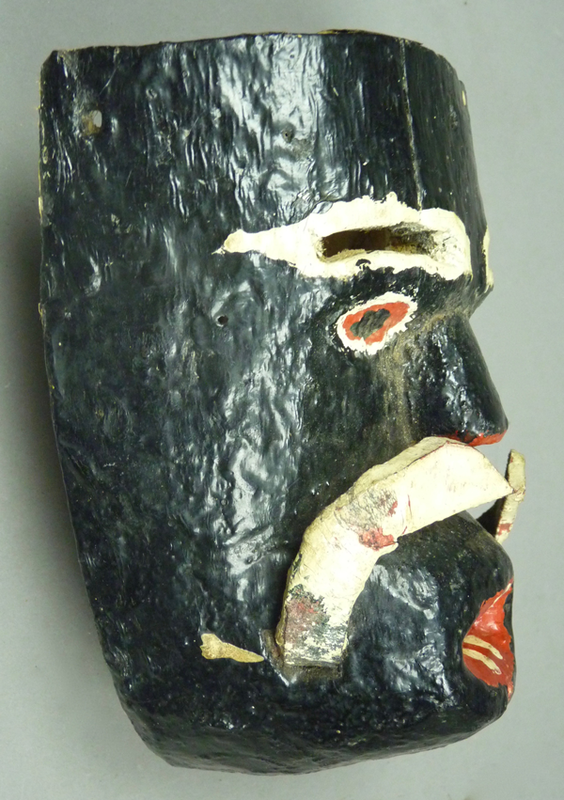 This mask is 6½ inches tall, 5 inches wide, and 4¼ inches deep. 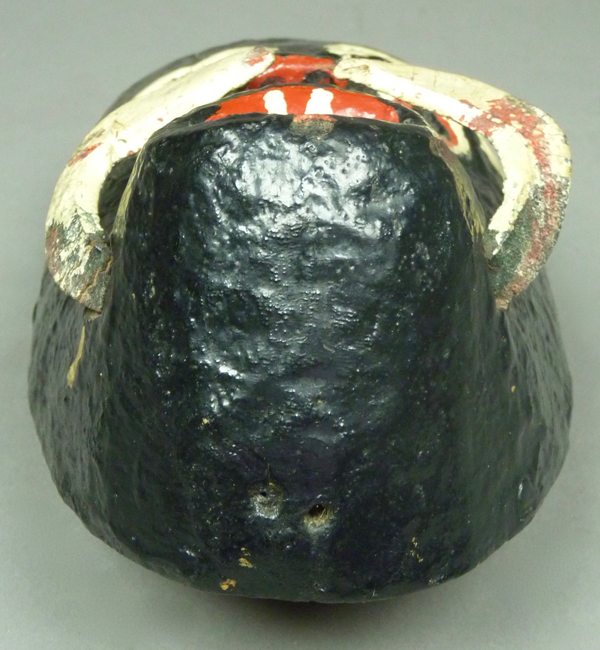 The back has been painted black, which makes assessment of use difficult. 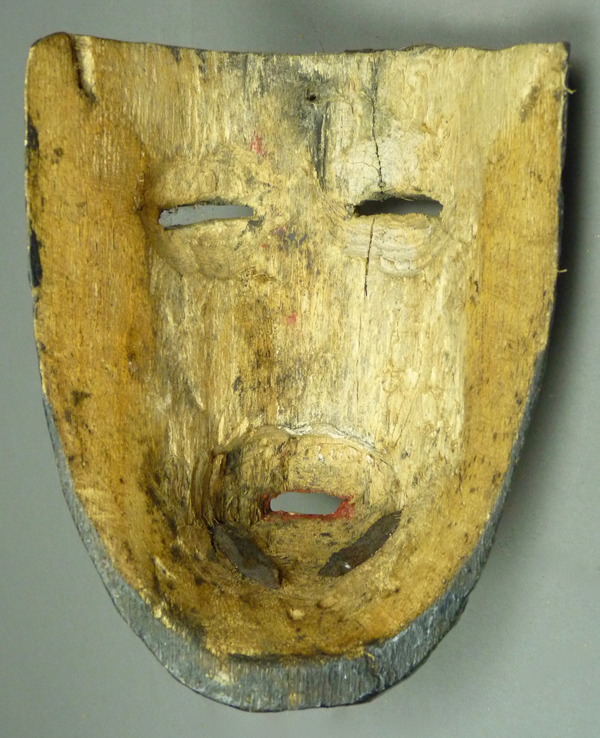 Here is the second mask of this pair. This one has that same terrific integrated nose and mouth combination. All the slots are open on this mouth. The two masks are identical in size. This back has also been painted black. 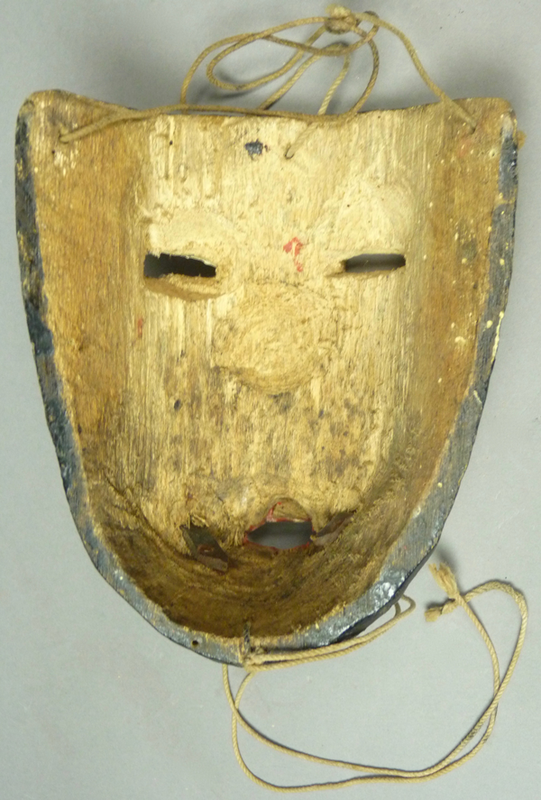 The right edge has broken away from the mask, due to insect infestation. 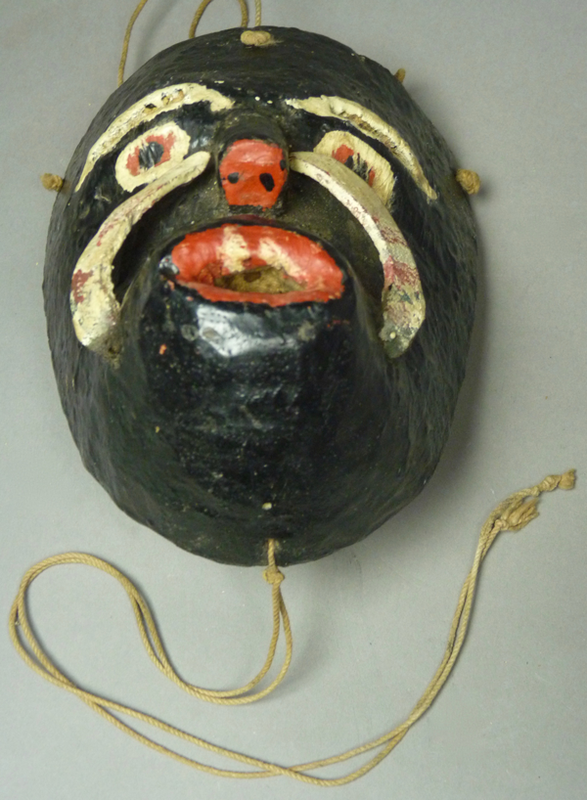 Next week we will examine some other masks from the region of the Sierra Juárez in the Mexican State of Oaxaca.